"Would you eat off a toilet? I could not believe it. 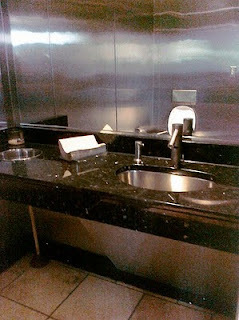 The bathroom in the BP gas station at 5001 Connecticut Ave. is beautiful. The fixtures and paneling are all made of stainless steel. The countertop is the deepest blue with specks and sparkles of gold. The floor is ceramic tile. In my experience it is always spotless. It looks like it should be in a fine hotel. John believes in treating his customers with greatest respect, and it shows. With this lesson in mind, I visited the bathroom at the Sheetz Station in Hancock, MD during my family vacation. It was a functional bathroom, also unisex like the bathroom at the BP Station in DC. It was a little dirty, but I was pleased to see a note placed above the mirror with the following statement. Not long before reading this I had painted a picture called The Onion and The Orchid. Not long after seeing this I wrote the blog post of the same name. I explained in that post that an onion letter is a letter you write when you have a bad experience with a business. An orchid letter is written to a business that exceeds expectations. I emailed Mr. Sheetz. Guess what? He emailed me back the very next day. At this point you might wonder why a medical advocacy blog is writing so much about gas station bathrooms. 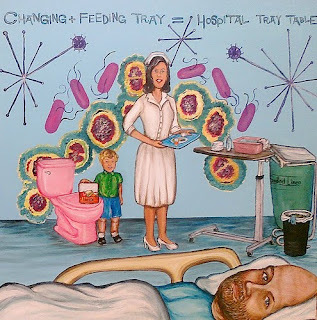 It is simple really; we expect gas station bathrooms to be a little dirty, and in juxtaposition we expect hospital bedside tray tables to be really clean. I am sure many readers of this blog are familiar with the rolling adjustable table used in hospitals for the food service. Perhaps they have even seen it used to hold prep supplies for a dressing change of a surgical wound. I was astonished when I saw the other way it is used. If a patient is incontinent the bedside table becomes a changing table. Each hospital may use different supplies. Some use adult sized wipes and foaming soap. Some facilities personnel use piles of white washrags and throw the rags in the soiled linen container. I was astounded as I was instructed that this was the proper way to do a change. I have worked as a preschool art teacher for many years and we would never use a changing table to feed a child. I focused much of my advocacy on records access. Yet, when Institute For The Future created a visual competition called Bodyshock the Future, I thought I must address this issue. My entry is called Would you eat off a toilet? I created a painting called Are you alright?. This was the euphemism a nurse used to ask my husband if he needed a bedding change. I wrote more in depth about that in the post Code Brown. Well, I will try to help other patients and caregivers by spreading awareness of the multiple uses of that bedside table. After I tweeted my entry to BodyShock The Future, my friend Peter Amsel, better known as the crazycomposer on Twitter, pointed out that Mythbusters had already proved that a toilet seat is cleaner than most surfaces in a home. I loved his comment, partially because when Fred was hale and hearty we had watched that episode as a family. The main reason I thought his comment was so apt was because it proved the need for greater awareness. The toilet seat is as clean as it is because we clean it with the knowledge that it is a toilet seat. But when I floated this art awareness proposal around to my friends, some of whom are doctors, none were aware of the dual use of the table. We need to know. We need to know so we can protect ourselves. “I thank you for your ‘onion’ letter and I apologize for the conditions you encountered. We will work to make it better and hopefully one day we will earn an ‘orchid’ letter from you! I’m very familiar with this store because it’s one of the only ones in the company with one restroom for both males and females, a situation I don’t like. 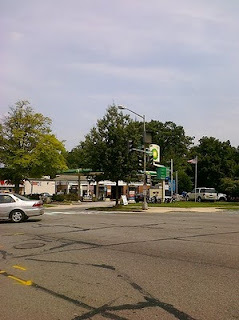 We can’t expand, as we would like to because of zoning issues so we have to live with the current state. But believe me this is no excuse for the conditions you encountered. As I said we will work hard to make it better! I read your blog and found it very interesting. 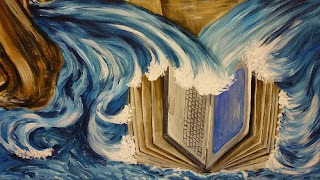 You are a very talented writer as well as painter! You touched a chord with me because my brother was diagnosed with kidney cancer in February 2006 and died August 21st, 6 months later. I spent a lot of time with him at the Cleveland Clinic and really feel we had great care, unfortunately it was stage 4 when it was caught and the only hope at that point was ‘trial’ drugs. I wrote an onion letter to Fred’s first hospital, the one we stayed in for almost four weeks. They wrote back two months later. They said they would use my many comments as educational opportunities for staff. They had excuses for their behavior in virtually every instance including the poor communication about my husband’s bedding changes. They did admit, upon reflection, that they regretted they never had a family meeting with us. 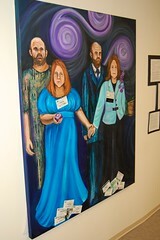 I went back in person on May 14, 2010 and told them of my advocacy. I encouraged them to place “Speak Up” patient advocacy signs throughout the facility. The customer service representative took my name and number and email. I am still awaiting a return call. What does a Sheetz and BodyShock the Future have in common? They are both trying to harness the power of communication. The BodyShock competition gives us a reason to read about brilliant visual ideas that could change the future of medicine. 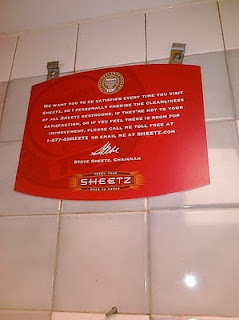 Sheetz believes so firmly in their customer relationships within new media that the president responds to emails from consumers. They both get the idea that future is about transparency, relationships and communication. They get the power of social media. I hope you can vote in the upcoming days on my entry. We can change things if we are all willing to speak out. Shall I write about Fred Holliday II, PhD today? Should I regale you with tales of my loving spouse? He was a pop-culture maven, a hilarious partner and loving Dad. Or should I tell you about Freddie Holliday III? He is my fun, impulsive, brilliant son, who happens to be on the autism spectrum. I so often write about Fred Holliday in this blog. But today, I shall write about the first Fred. In March of 1993, I met my future father-in law, Fred Holliday. He was big and smiling, with a gray beard and glasses. He ran a hardware store. I loved that he ran a hardware store. As a child, I used to visit hardware stores for fun. I am also the only bride I know that registered for a cordless drill. Fred and I got along very well from the start. I even worked in the store occasionally after I married my Fred. Fred always chuckled at my inability to use the cash register with confidence. He could not believe it when I eventually ran a store that used six registers at one time. Fred was such a kind storeowner. He would often get calls at night while eating dinner. He would open up his store after-hours to help these customers in need. Fred Sr. was also mayor of the Town of Grantsville. He had done so many good things in that town. He was an active member of the Lion’s Club and was always doing volunteer work and very involved in his local community. In 1998 he decided to run for County Commissioner. I was very pregnant with little Freddie when I attended Fred’s first fundraiser in the summer of 1998. It was a steak feed in the park in Grantsville. It was such a nice day. In September when little Freddie was only a few days old he sported an “Elect Fred Holliday” pin on his baby blanket. Fred Sr. was elected to his first term later that fall. Fred is an excellent county commissioner and has served in this post for almost 12 years. He has been and always will be a dedicated public servant. He takes his responsibilities and duties very seriously and is one of the most contentious elected leaders I have ever met. In March 2009 when my husband Fred fell sick. My father-in-law would drive up every weekend to visit his son in the hospital. He would ask his son if he could stay and help in anyway. My Fred would say, “No, Dad you go back and do your job as County Commissioner. You have a very important job.” My Fred was so proud of his father and loved to see him do his very important job. So, Fred would leave his wife with me and drive those lonely 2 and 1/2 hours back to Garret County. He would work all week as County Commissioner and each night go home to an empty house and think of his dying son. 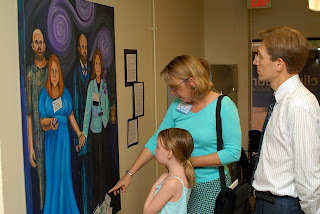 On June 17th 2009, as my husband breathed his final breath his family and friends surrounded him. His friends David and Jeff were there. I stood beside Fred’s bed with Isaac in my arms. My mother-in-law Joan and our son Freddie stood at the other side of the bed. The only one missing was Fred Sr. He was driving up to visit as his son died. A lot of people might have become bitter about their job and life after such an event, but not Fred. He continues to work within the community for the greater good and he continues to do his job. And he does it well. This fall Fred is running for re-election as the Republican Candidate for County Commissioner in Garret County Maryland. Back in the spring, I offered to help him in anyway I could. He asked if I would mind painting two campaign signs. He wanted his face painted about 3 feet high and the text would read Re-Elect Fred Holliday County Commissioner District 2. It takes a brave man to want their picture so large. Well, Fred has always been a brave man. So those signs now are displayed in Garrett County for all to see. I hope the people who look upon his smiling face will know what a great man he is. I hope they realize what an amazing public servant they have working for the best interests of the county. I also helped by going door to door asking Garrett County residents if they would be willing to place signs of support in their yards. Some folks were willing some were not. A few folks told me they were Democrats. I told them I was too. I said that Fred Holliday was the man to support regardless of party affiliation. They put up signs in their yards. I was so happy. During the fight for Health Care Reform, I saw a lot of mud slinging by both political parties. I am so happy when I can see people stand together and support a common good. I will try to help in another way by inviting all of you to attend his upcoming fundraiser. Tickets are available for $20.00 per person on site or call Joan Holliday 301-865-5387, Sue Beachy 301-895-5387 or email fjholliday@hughes.net. This is my entry in the Ashoka Changemakers Patient Empowerment Competition. I hope you have a chance to read and comment on my entry. Fortunately for me, my mother-in-law collects magazines. If you ever visit her idyllic country home in western Maryland, you will see them artfully arranged in crocks and antique half-barrels. They are quite pretty and colorful as a home accent, especially the covers of the periodical Country Living. They can be easily read, and they span decades. Actually they are quite a resource, as I haven't found many of the articles from these periodicals available using a Google search. I do not usually read women's magazines. I usually read books, online articles, or the local newspaper. I always try to bring a book with me to the beauty salon, as I find the pile of fashion and home care magazines a bizarre foreign territory. Once I forgot to bring my book to a hair appointment and spent quite a while sifting through a mountain of Vogue and Good Housekeeping in order to find one Architectural Digest at the bottom of the heap. Although I do not often read these types of magazines, once in my life they were the only periodicals I read. In late March of 2009, I began reading these light and airy magazines as I sat with my mother-in-law at my husband Fred's side during his hospitalization. Most of the magazines belonged to my mother-in-law Joan. She brought piles of them with her to the hospital. As we whiled the hours away waiting for a surgery that never came, we read. We read everything she brought. When we finished those magazines Joan would stretch her legs and go to the cafeteria to get a coffee. Then she would stop by the gift shop and come back with another handful of magazines. I find I hate most magazines published in March 2009. 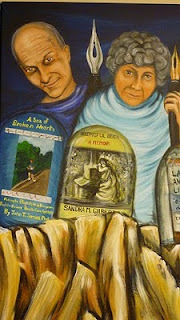 Be it Family Circle, O, People, or any other title, I have read it cover to cover, and I loath it. Joan and I would sit there waiting--for the doctors, for the tests, for some answers to our questions with nothing to stop our frantic swirling thoughts. As we sat within a maelstrom of worry we read these magazines. Each night I would research kidney cancer online, and each day I would read about the life and times of Sally Field or find out about the best method to clean a shower head. After weeks of such reading, Fred died in June. I found out I could no longer read a book. I could not fall into the warm embrace that literature had once provided me. My mind was a gnat always flitting away. I would prowl Joan's living room at 2:00 in the morning in the weeks after the funeral. Desperately, I looked for something to read. Under a pile of Country Living from 1993 was an old Family Circle with an article by an author named Ann Hood about onion letters and orchid letters. My mind stilled as I began to read. Ann Hood wrote about her past experience as an airline attendant. She wrote about a concept called the onion letter and the orchid letter. Apparently, if a customer wrote a letter to the airline extolling her virtues and excellent service that letter would go in her employee file as an "orchid letter". If her service was abysmal, she might get a letter pointing out her many faults and that too would enter her permanent file as an "onion letter". As Ann's life continued and she became an author, she utilized this concept she learned as an airline attendant. She took the horrible frustration she felt when being met with bad service and channeled that into onion letters. Her goal was not to get cash back or a reward. She was doing this to alert the business of the bad service she had received in a hope of creating a better experience for those who came after her. She was also doing this to regain dignity and respect that was denied her by the uncaring service person or institution. After she wrote the onion letters she also began writing orchid letters to spread the happiness she felt upon being treated well. In her article she encouraged everyone to write onion and orchid letters in order to facilitate better communication in every aspect of our lives. It was a great article. It struck such a chord with me. Having worked in retail environments for 16 years, I have received quite a few orchid letters and even the occasional onion. I know how much these letters can affect you as a service provider. As I read the article I thought about the onion letter I had sent just a few weeks before. While Fred was in hospice I wrote a very long letter to the first hospital Fred had been admitted to. This was the hospital that told me I could see his record after I paid 73 cents a page and waited 21 days. I sat next to my sleeping husband as he approached his death and calmly wrote a letter that referenced his medical record and provided dates and names and recounted the many types of harms this institution had inflicted upon Fred. My sweet Fred was laying there dying, and I was writing an onion letter. Why do this? I wasn't preparing to sue the hospital. My reasons for writing were far closer to the reasons Ms. Hood gave for writing an onion letter. I wanted to inform the management of this facility of the problems we had encountered. I had hoped we could encourage a necessary change within the organization. I hoped to channel the grief and frustration I was feeling into some kind of positive outcome. 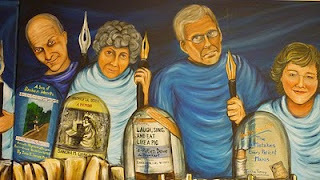 I also wished to regain our dignity, for in the process of becoming victims we had lost our personhood. Fred was not the patient in room 6218. He was Fred Holliday II, PhD. I was not "Little Miss A-Type Personality". I was Regina Holliday. We had names; we were people. As I read Fred's record I grew angry that the story of his care never called him by name. He was only the patient, and I was only the wife. When did HIPAA compliance trump personhood? I thought of all the ways they took our names away. They dressed Fred in faded hospital gowns that made him look the same as every other patient they had ever treated. They made our friends and family wear visitors' passes every day. It was a name tag wherein the names of all those who loved Fred became simply a non-descript: "Visitor to RM 6218". It reminded me of the book A Wrinkle in Time. In that children's tale a cloud of darkness is putting out the stars in the sky. I remember a particularly chilling scene on a planet controlled by darkness. On a street where all the houses look the same and all the children look the same the little children bounced their balls in unison to the beat of a sinister heart. Within this mockery of child’s play, one boy did not match the rhythm of the others. As he faltered in his attempts to bounce the ball, I could not help but think he would be terribly punished for being so out of step. So in a way my onion letter was an attempt to stop the darkness from overtaking us all. The characters of our childhood can tell us so many things. They can warn of us of danger or give us advice. And these characters can tell us that onions have layers. In the summer of 2001 our two year old son Freddie saw his first his first movie in the theater. This was a proud moment for Fred. He was pursuing his doctorate in film studies at the time. He was so happy to take Freddie to his first movie. It was the film Shrek. In a conversation the ogre Shrek had with his friend Donkey, Shrek explained that ogres are like onions: they have layers. In writing my onion letter, I found Shrek’s statement to be horribly true. I wrote page upon single-spaced page detailing the many failures and miscommunications. Months later I got a response. The hospital, physician’s board, and insurer had decided that Fred had been treated within the “standard of care”. Well, if Fred’s care was standard, the standard must be changed. 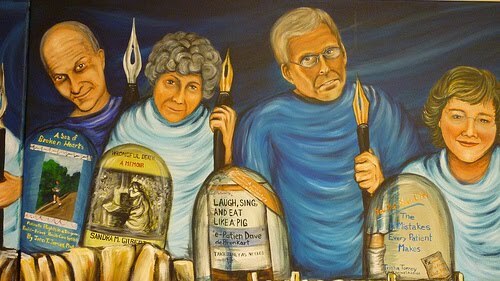 I began to peel back the onion of our experience and paint those images on walls and jackets. I would remove a layer and cry. I would speak, and I would share our horror, and so doing I slowly regained our personhood. If you came to the "e-Patient Ephemera" art exhibit at Clinovations on July 29th you would have seen a painting entitled The Onion and The Orchid. The painting contains two Freds and two Reginas. Fred and Regina on the left, look sorrowful and worried. Upon close inspection, you will see Fred’s gown is made of paper bus transfers from the months of March, April, May, and June. Regina is wearing a visitor’s tag, and more tags have pooled at her feet, and in her right hand she holds an onion. They have lost their names and identities. The Fred and Regina on the right seem proud and hopeful. Fred is now dressed in a suit made entirely of his business cards. Again and again his image says Frederick A. Holliday PhD., American University. Regina is wearing a speaker’s nametag from WHIT 2009. At her feet pool nametags from Health 2.0 goes to DC, Cerner and the Better Care Campaign. In her left hand she holds an orchid. That orchid is a type of ephemera. It was sent as a thank you gift from by the staff of National Partnership of Women and Families after a speech I gave on June 24 at their annual luncheon. That flower meant a lot to me. It almost seemed like a gift from Fred and the Partnership. Throughout our marriage Fred was only allowed to give me flowers if I appeared on stage. Money was always so tight, and I only was onstage a couple of times during our marriage. It was a perfect compromise. So when this flower was delivered I cried. I cried for joy. The wonderful people at the National Partnership and the Better Care Campaign had listened to me tell our tale and had spread the word far and wide. They had listened as I peeled an onion and in return gave me an orchid. I cried because I knew Fred would be so happy and proud. The orchid will lose its blossoms soon. I have given it to my mother-in-law. She is much better with green and growing things. Perhaps she can save it, or perhaps it will die. But it will always be blooming in the picture, and Fred will always be standing beside me wearing his name. That is the story of The Onion and The Orchid. In writing this I tried in vain to find a link to the original article by Ann Hood. I found two other blog posts about it. I also found out that Ann Hood lost her five year old daughter Grace after a strep infection raced through her body in a 36 hour period. She wrote a book called Comfort about the horrible grief that consumed her after that event. In a magazine I read an article by an author who has suffered so much. I hope she knows how much her writing has helped all the rest of us who find her while we are grieving. And after all of these things I have seen and read I will never look at women’s magazines in the same light. 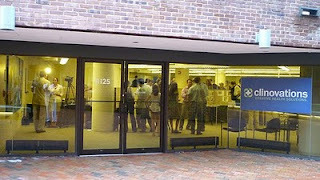 "Give Us Our Dammed Data"
On Thursday night in an office space in Georgetown a crowd was forming. It was an after-hours crowd. The room was filling with advocates, artists, professors, and students. There were doctors, IT professionals, authors, and members of the community. There were mothers, fathers, grandparents and children. They had all come to see an exhibit of art. This office was the shared space for Clinovations and Osmosis. The wonderful folks at Clinovations had suggested placing one of my paintings in their space to brighten up the blank white walls. 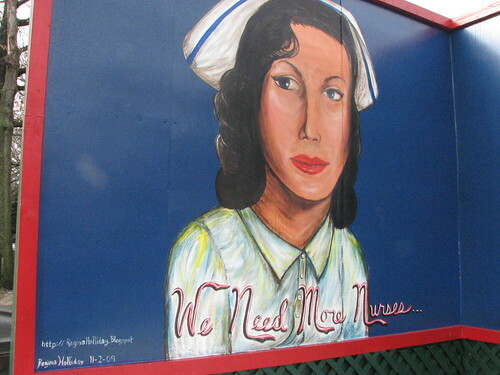 Perhaps one of my paintings would support an even greater awareness of the need for patient-centered care. I thought, why stop with one painting why not many? Why not have an entire show and invite people from every facet of health care and beyond? I wanted to create a space for conversation and networking. I wanted people to get together and have some face time surrounded by art. I envisioned a crowd of people thinking of ways to provide better care for patients everywhere. As I thought about this, I realized that this concept would be the focal piece of the show. Give Us Our Dammed Data is my first crowd-sourced painting, and it features quite a crowd. 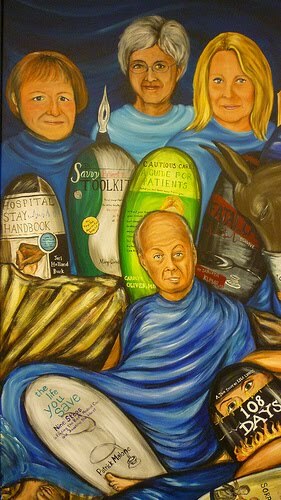 I wanted to paint a citizen army of patient advocate authors. I knew quite a few from Facebook and Twitter and had read their work. So I asked for suggestions from Dave DeBronkart, Trisha Torrey, Lisa Lindell and Helen Haskell. Between the five us we created a list of potential authors. Helen suggested I contact all of them and ask their permission to include them in the painting. With her help I found their addresses. I really enjoyed the give and take of emailing each author. I explained I wanted to paint them and their books. And so another crowd gathered in Georgetown on Thursday night. They did not move or laugh. They did not drink wine or nibble the delicate appetizers. Instead, they stared down upon us with sorrowful smiles. 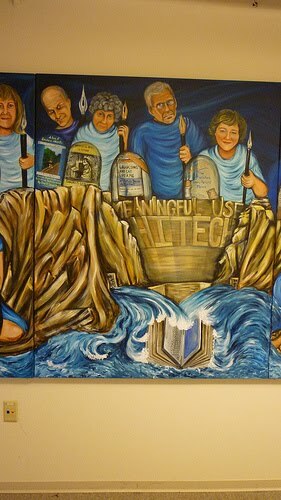 In a room usually filled with laptop computers and hushed conversation hung a large painting picturing a crowd of authors. These authors’ books span 15 years, and all of them are telling a very similar tale. 17 authors with weapons in hand stare down upon the viewer. The three panel painting measures 60 inches by 144 inches. 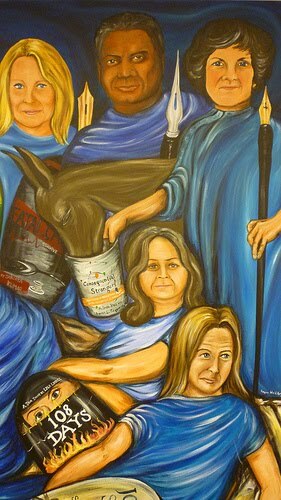 It is a very large painting, and yet it is crowded with many who have been hurt and many who have suffered. Every one of them is an author. Most of the authors in the painting took the hurt and outrage they felt about a dysfunctional medical system and channeled that into a book. That book is their shield and their pen is a spear. These are people who have taken up arms in a battle they had never intended to fight. Note they are dressed only loose robes or hospital gowns. Their feet are bare. They dress as the supplicant or the pilgrim. They are on a mission. For some of the citizen soldiers it has been a very long path. Journalist Michael Millenson’s Demanding Medical Excellence was published in 1997, and as you read it it is hard to comprehend it was written 13 years ago. It reads like it was written yesterday. So in the far left panel Michael’s back faces the viewer in the piece. The public has not been listening. He is turned toward a fellow advocate who will spread the word. He is speaking to Julia A. Hallisy who looks concerned. And so she should. This is Julia A. Hallisy, whose daughter, Kate, fought a losing battle with cancer in her short life. In 1997, Julia was well aware of the failings in our health system as she desperately tried to get an oxygen machine so her ten-year-old would be able to breathe as cancer was attacking her brain. Below Janet sits Martine Ehrenclou, author of Critical Conditions. Martine spent over a year guiding both her mother and godmother through medical wilderness. She saw so many hazards and “never events.” She was determined to create a book to help others survive their hospital stay. 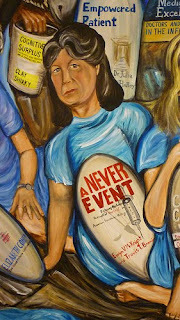 To Martine’s left sits Evelyn V. McKnight, author of A Never Event. Evelyn contracted hepatitis along with 857 other cancer patients due to reused contaminated syringes. Beside Evelyn sits Elizabeth Cohen, Senior Medical Correspondent with CNN. 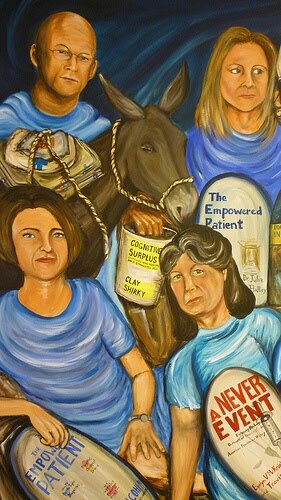 She will soon publish The Empowered Patient: How to Get the Right Diagnosis, Buy the Cheapest Drugs, Beat Your Insurance Company, and Get the Best Medical Care Every Time. She has used her years as a patient and a patient advocate for her family members to help others. Informed by years of reporting medical tragedies as a reporter, she too felt she must write a book. In the far right panel on the lower right side sits Sorrel King. Hers is one of the sadder stories in this piece. She alone stares out of the frame and seems to make eye contact with someone who must be quite small…. 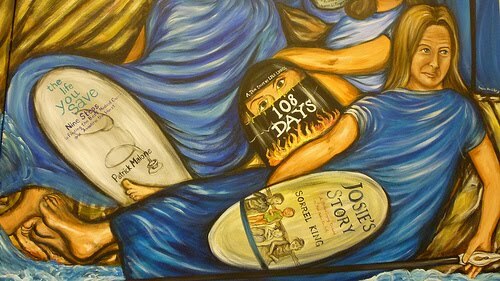 Sorrel lost her daughter Josie. Josie was only 18 months old. Josie was recovering from a bad burn when she died from severe dehydration and unfortunate dose of narcotics. Sorrel knows intimately the importance of patient and caregiver access to medical record. Being able to read the orders in a record can save a life. Seated behind Sorrel to the left is Lisa Lindell. Lisa wrote 108 Days. In her book she tells a day-to-day account of her successful campaign to keep her husband alive. She was astounded when she read her husband’s medical record. The nurse’s notes specified that she had an “unreasonable” belief that her husband should live. Beside Lisa sits Patrick Malone a malpractice attorney and patient rights activist, who wrote The Life You Save. Patrick lists nine necessary steps to getting the most out of the current medical system. The number one step is: Get a copy of your medical record. Behind Patrick to his left stands Jari Holland Buck. She wrote Hospital Stay Handbook. She would understand the frustration of Lisa Lindell, as she too, kept her husband alive during his hospital stay. 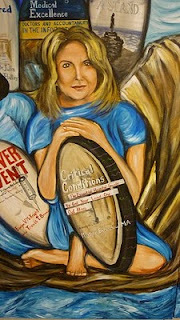 Beside Jari stands Margo Corbett, the author of The Savvy Patient Toolkit. She became inspired to advocate after she was told her husband may not survive the night. 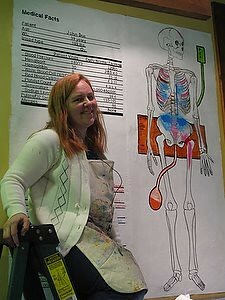 She used all of her talent and past job experiences to create a guidance book for patient care. To Margo’s Left stands Carolyn Oliver,MD, who wrote Cautious Care: A Guide to Patients. 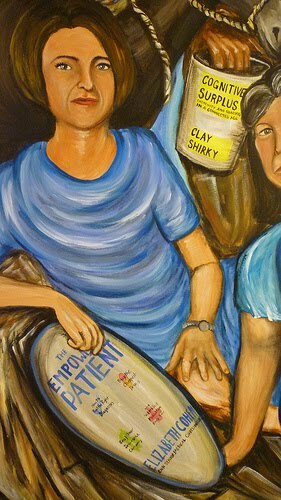 This was the first patient empowerment book I ever read. Fred Trotter gave me a copy after I asked an access question before the crowd at Connect 2009 in DC. I loved it its simple and clear instructions. Next in line is Sanjaya Kumar, MD author of Fatal Care. Dr. Kumar is dedicated to the improvement of patient safety and real time collection of data. In the center panel to left stands John James. He lost his son Alex at the age of 19. John was astounded when he read Alex’s medical record. He saw so many mistakes and examples of miscommunication that led to Alex’s death. To John’s right stands Sandra Gilbert author of Wrongful Death. Her husband died during routine surgery. Her story recounts her efforts to grieve while trying to find out what exactly had happened. In the center stand the ones who lived. Dave Debronkart author of Laugh, Sing and Eat Like a Pig and Trisha Torrey author of You bet your life, The 10 Mistakes Every Patient Makes complete our 17. They had a very different experience. They got access to their medical records; they fought the system and won. The title of the piece is a play on the words Dave spoke: “Gimme my damned data.” His phrase described the anger and frustration of all of us who have suffered so in a system where a patient sees a record only as an afterthought. I decided to expand on his comment and add an actual dam. So in the middle of this painting stands a version of Hoover Dam labeled Meaning Use, HITECH. The data may still be dammed, but now it has begun to flow and it is pouring right into a laptop computer. We may have to wait three days, but due to government action, we will get access to our records. This has been a long post. I may have lost some of you in listing all of the advocate authors. I hope you are still reading for there are two others in this picture. To the far left stands Clay Shirky author of Cognitive Surplus, and to the right is Melinda Blau, author of Consequential Strangers. They are feeding the pack mules. Every army must have pack mules. They supply the troops; they carry the supplies and are sure-footed on the mountainous path. If you haven’t read the books I would recommend them to be read together. Melinda reminds us of the power of all the people in our life. It is the friend’s friend who often gets us the job or finds us the right doctor. Clay Shirky informs us of the inherent potential in a world where thousands of people log on and data crunch with no other goal than doing good for others. He sees the future of medicine when it combines with the data aggregation of sites such as Patients Like Me. So this is the story of Give Us Our Dammed Data. 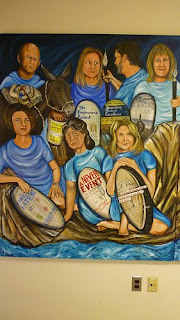 It is a painting that had 17 advocate authors. I could have painted more. I could have covered every wall in the Clinovations office space with advocates who are fighting for us. I stopped with 17. Why? There are 17 people in 73 Cents. There are 17 pills in another piece at this exhibit, Sutent in a Shadow Box. And I took up my shield and sword on June 17th 2009. My shield is a canvas and my sword is a paintbrush. I am so glad my art can create a space where these authors can look upon us as the mighty army they are. I am in awe of the work they have done. I hope you will feel the same.